Darling and devoted, the Cesky Terrier is a loyal little dog that is dedicated to working hard. Though reserved towards strangers, they are not aggressive and tend to be more quiet and calm than their cousins. Like all terriers, the Cesky terrier loves to dig, and though more reserved than others will still take off in chase after anything it considers to be prey; whether animal or toy. This is an excellent breed for those with other pets as it is generally good with other dogs and already existing household pets. The breed is also good to have around children as long as they are taught to be gentle. An excellent dog for those with little space, the small Cesky Terrier loves to head out for a jog or play fetch in the house. This is an excellent, fairly easy upkeep animal for the novice owner. Monthly grooming is necessary as the coat requires clipping rather than stripping. They can be slightly difficult to train, so training should be started at a young age and engaged with patience as the Cesky, like most terriers, can be easily distracted despite its intelligence. 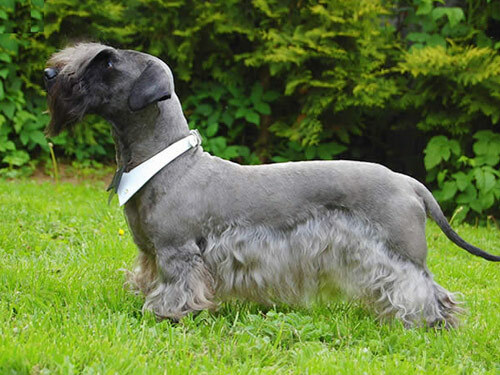 The Cesky Terrier is a very hardy breed that is prone to few medical concerns. Also known as the Bohemian Terrier, the Cesky exists thanks to Frantisek Horak, a Czechoslovakian breeder who attempted to breed a dog with a narrower head and chest and softer coat. It is a relatively young breed originally designed to hunt vermin in their dens. Additionally, Horak took care to breed an easy-going personality into his dogs, making the Cesky Terrier a delightful companion despite its small size. They were first imported into the United States in 1987.